A Pinot Meunier Specialist in the village of Le Breuil in La Valley du Surmelin. 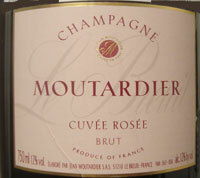 Moutardier is run by a dedicated Englishman Jonathan Saxby, a very unusual occurrence in Champagne. He married into Champagne Moutardier by marrying Jean Moutardier’s daughter Elisabeth in 1992. The Moutardier family has been in Le Breuil, 20km southwest of Epernay, for over 250 years, and makes a stunning 300,000+ bottles a year all from locally grown grapes. They use primarily Pinot Meunier, which Saxby thinks doesn't get the respect it deserves. He has made it a major part of their brand, and he uses the term "‘modern meunier’ - made using modern methods and modern equipment. Pinot Meunier is one of three major Champagne grapes and certainly important, although many producers leave it out of their best wines. It is certainly a fun grape, making fruity, smooth, and yes, "fun" wines to drink. I'm NOT convinced it can make truly profound wines myself - but would love to be surprised. And yes, I do like Moutardier's wines, outlook, and attitude, one of looking forward with Champagne while respecting its history and traditions and making a more "modern image" for Champagne. Let's be serious: the planet should be drinking more Champagne and a modern image may just help with that. Meunier is indigenous to the area, and comprises 80% of the family's southerly facing 18 hectares, with the rest 10% Chardonnay and 10% Pinot Noir. All other grapes used are purchased from nearby producers and locally grown, all in the la Valley du Surmelin. Fermentation is in temperature controlled stainless steel vats. Carte d'Or - Non Vintage with 85% Pinot Meunier and 15% Chardonnay. Cuvee Millesime - A vintage wine which is 85% Pinot Meunier and 15% Chardonnay. Cuvvee Rosee - Non Vintage with 80% Pinot Meunier and 20% Chardonnay. See my tasting note below. Pure Meunier - Non Vintage and technically a Blanc de Noirs, this 100% Pinot Meunier wine has zero dosage and is as pure an expression of Meunier as possible. Cuvee Selection - A standalone as it is half Chardonnay and half Pinot Noir in contrast to the other wines which are primarily Meunier. Also a Non Vintage wine. The color is a deep pink/copper/mahogany, with a moderate amount of bubbles yet it pours with a big head like a beer. Love that color! The nose starts with fresh orange peel and has some red fruits. Light and lively. Very tasty and fruity, nicely to my taste yet somewhat on the simple side - or perhaps better put, not complex. A fun wine certainly, and although light on its feet with good body, enough substance to match substantial food.